LAS VEGAS – Mandalay Bay Security Officer Jesus Campos broke his silence and appeared Wednesday with Maintenance Engineer Steven Schuck on The Ellen DeGeneres show. Questions that were pertinent to the timeline were not asked. Nothing about time or timelines was even addressed or mentioned. What we were left with was more questions in what has been one of the worst public relations nightmare for both the Las Vegas Metropolitan Police Department and MGM Resorts International. It was a rehearsed publicity stunt. It was apparent that DeGeneres was briefed before the taping of the show, which occurred on Tuesday. She tossed softball questions and perhaps there is a reason to why she did not press with hard questions. MGM sponsors DeGeneres’ slot machines on their properties. In November 2014 MGM Grand Detroit became the first casino in the gaming market to offer the Ellen’s Dance Party Video Slots and The Ellen DeGeneres Show Featuring 12 Days of Giveaways Video Slot. Both games contain original voiceover work by DeGeneres. Ellen: First off, how are you both doing? Campos: I’m doing better each day, slowly but surely just healing physically and mentally. Schuck: It’s definitely hard, as each day passes though we’re working to get over this. Ellen: Jesus, you were the security officer and you were called to check on the door that was, I guess when a door is left open for a certain amount of time, you’re supposed to go check on it, right? Campos: We get notifications making sure that, to secure them, or if they have already been secured, making that check on the doors. Ellen: So you were going up the fire escape to get there? Campos: We have a stairwell from, from, I was coming from the 31st up to the 32nd. When I approached the door it didn’t open, it was blocked off, I had to re-route. Ellen: Is that a normal thing that the stairwell would be blocked off? Campos: No, they’re always supposed to remain open and so after I had dropped down and then came back through the hallway and then I had approached the [gunman’s] room got into the door [outer door that leads to the stairwell door] there was a metal bracket holding the door in place. Ellen: [Pointing to a diagram of the 32nd floor of the Mandalay Bay] Right, so what where talking about here just so everybody is clear, okay so this is where the hotel room where the shooter was, this is the stairway, this door here was blocked off and you didn’t know that until you came up through the elevator and went through this door and saw there was something blocking that door. Ellen: And when you saw that did you think that was weird, why somebody put brackets on a door. Campos: Yeah, that’s just out of the ordinary. Ellen: That was the beginning. Ellen: OK, and then you walk out of this and this just slammed [she’s pointing to the outermost door to the stairwell]. Campos: Um, well when I was between that area I was calling Security Dispatch to get in contact with engineering. They didn’t know anything about it, so they dispatched an engineer to go verify what that was. Ellen: That’s when you got called? Campos: And at that time I heard uh, what I assumed was drilling sounds and I believed that they were in the area working somehow. Ellen: You thought the drilling, they were gunshots, but you thought it was just drilling sounds. Campos: At first, I think, it was just drilling sounds. Ellen: Right, so then, at what point did you get shot, what happens here? 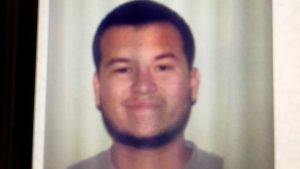 Campos: Um, as that doors closing it’s so heavy it almost slammed, I’m walking down this way [down the hallway, away from the gunman’s room] and I believe that’s what uh, caught uh, the shooter’s attention. Um, as I was walking down um, I heard rapid fire and at first, I took cover, I felt a burning sensation, I went to go, lift my pantleg up, and I saw the blood, that’s when I called it in on my radio, that shots have been fired, and I was going to say that I was hit, but I got on my cellphone, just to clear the radio traffic for, so they could coordinate the rest of the call. Campos: Yeah, from behind the door, I didn’t know how he was shooting. Campos: But he shot out. Ellen: So you didn’t even know that it was coming in from here. So, Steve at this point you’re called up, you just think that you’re coming to look at a door that’s been blocked at the fire well right? Schuck: Yeah, I didn’t think anything out of the ordinary at the time, I came from a higher floor, came down a different hallway service elevator and I walked out, rounded the corner from the one-hundred hallway and that’s when I, you know, it was quiet at this time [no shooting] and the doors are set back and you can see out about a foot and Jesus is at the end of the hallway, but I didn’t know at that time, I thought I saw someone like pop out of the cubby. I kept walking, once I got more than halfway is when I saw Jesus and I started to hear shooting and I thought at the time, I didn’t know it was shooting, I thought it was a jackhammer, you know, as an engineer we’re not working up here this late at night, we wouldn’t be doing that. Schuck: And I believe it was outside, it wasn’t in the hallway yet, and that’s when Jesus, he leaned out and he said take cover, take cover, yelled at me, within milliseconds if he didn’t say that I would of got hit. Ellen: Because he was still shooting, so you would have been hit, had he not told you. Schuck: Yeah, I wasn’t even fully in cover and they were passing behind my head and I could feel pressure. Ellen: You could feel the pressure going past you just being even out of the way. And were guests like coming out of the doorways? Campos: There was a female that uh, came out and I told her to go back inside it wasn’t safe. Shortly after, that’s when Steven was approaching, and I told him to stay back and get cover and that’s when more rounds were dispersed. Ellen: Right. Wow. So, and I’m really, he saved your life and saved also the woman who came out of the door in the hallway. All the key questions that should have been asked were not. We are left with even more questions. The question wasn’t even raised when or if they heard the gunman shooting for ten minutes into the crowd. Campos and Schuck didn’t even mention that. The timelines are still questionable and the radio traffic from the night of the shooting doesn’t fit with the statement that MGM Resorts International released last Thursday. Why it took so long before the police dispatcher was advised that the shots were coming from the 32nd floor, are still unanswered. What about the SWAT officer who fired his weapon. What were the circumstances around that. What’s the big secret there? The LVMPD interviewed Campos right after the shooting. Then it was reported that the FBI had to re-interview Campos because the timeline didn’t fit. Two-and a-half weeks since the worst mass shooting in United States history and we still don’t have a straight answer from the authorities. Is this investigation being focused on who might be at fault civilly? This battle of the six minutes is going to fall either on MGM Resorts International or the LVMPD. The press should scrutinize everything the LVMPD says from this point forward. Why should we believe anything at this point? I want to see the evidence they have to back up what they are saying. And that goes for MGM Resorts International also. Is this is a case of what a tragedy; we have heroes, the shooter is dead, no one to prosecute and let’s just sew the whole thing up and forget that it happened?